The Tripitaka Koreana is a Korean collection of the Tripitaka (Buddhist scriptures, Sanskrit word for “three baskets”), carved onto 81,258 wooden printing blocks in the 13th century. 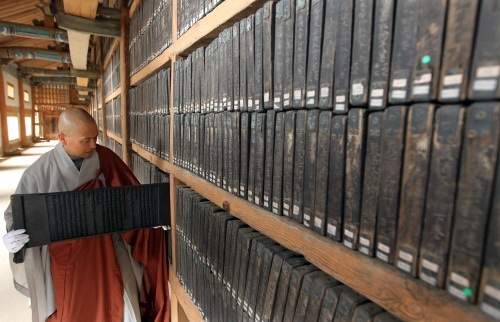 It is the world’s most comprehensive and oldest intact version of Buddhist canon in Hanja script, with no known errors or errata in the 52,330,152 characters which are organized in over 1496 titles and 6568 volumes. Each wood block measures 27 x 9 inches. The work is stored in Haeinsa, a Buddhist temple in South Gyeongsang province, in South Korea.